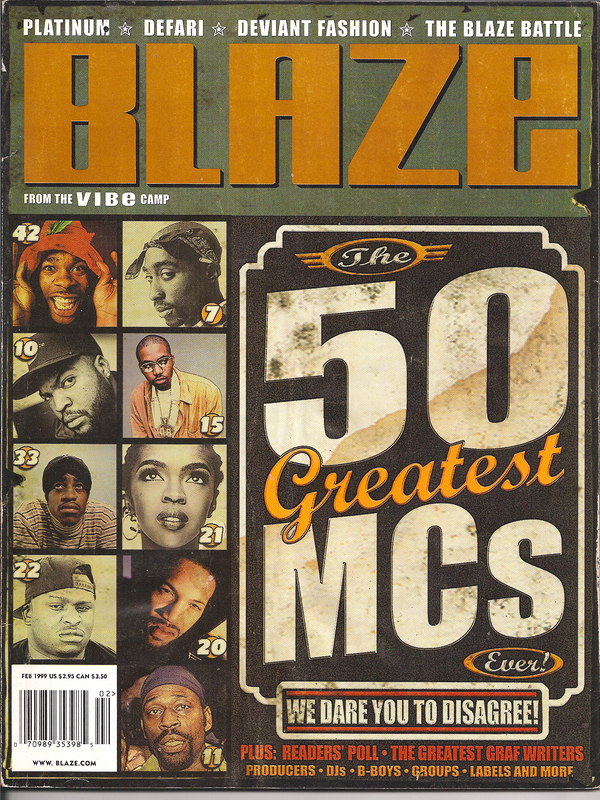 Blaze Magazine – The 50 Greatest MCs Ever! No Eminem (it was 1999) and my personal fav, no Ghostface (pre-Supreme Clientele). I distinctly remember feeling a ways when this issue dropped that neither Guru (RIP) nor Black Thought made the cut. And Pharaohe Monche should never be last on any MC list. The rest of the field after the vid (courtesy of Moblito’s, because I damn sure was not about to type all those names out.). I remember buying this issue and even posting it here http://thimk.wordpress.com/2008/12/15/goat-redux/. They also reviewed the greatest producers as well. But these lists could easily change every few years or so. And it could largely be based on popularity at that moment in time(i.e., Lauryn Hill was #21 at the time). i remember this as well. i still have the blaze magazine with swizz and manny fresh on the cover. i thought their ratings system was dope too. You forgot Jeru Da Damaja!!!! 22.Jeru Da Damaja!!!! i will put Jeru way before Scarface. How can anybody forget Jeru Da Damaja?? from back in the days on Tony Touch, and when it was suppose to be Jeru, Biggie & DJ Premier in Bad Boy. But Puffy diz Jeru & Premier by signing Biggie only. i remember having this mag and being surprised that they even had Andre 3000 on the list. but after all, this was at the height of Aquemini when it seemed like the rest of the world finally realized that Outkast…could rap. They put Big Boi on the honorable mention page. WTF? Cee-lo?!?! where’s black thought? Pharoahe is that low? no DMX? no offense. top half i agree with, maybe switch kane and krs – but the bottom half needs work. Fresh Prince? GTFOutta here. Where’s Missy? She’s gotta be on that list. No Mos Def? LOL. Woops. That’s a head-slapper. 1. TuPac 2. Eminem 3. Rakim 4. Ice Cube 5. Red Man 2pac is the GOAT period, Em if he wasn’t white there would be no question, Rakim for you youngsters do your research he was the one, without Cube there would be NO NWA he wrote 75% of their lyrics not to metion all the dope he put down after he left, and Red Man is a genius. I remember this issue. It was the first rap magazine I ever bought. It was the base of my hip hop knowledge. It’s great to see the list agIn and how much it has changed. Is there any way I can get this shipped to my house at 32 Shiloh springs Jackson Tennessee.